Boston Estate Buyers has been your trusted New England investment coin buyers since 1959! As a top rated Boston coin buyer and a member of the American Numismatic Association, Boston Estate Buyers has an excellent reputation for providing fair and honest investment coin appraisals. Plus we offer immediate cash payouts when you sell your old quality coins and rare coins to us. If however, you just need money and you do not wish to sell your investment coins we also offer loans against jewelry and investment coins. Simply call Boston Estate Buyers at 617-523-1193 or send us an email to set up an appointment to have your investment coins evaluated! Here are some of the most commonly asked questions about investment in gold and silver coins, as well as coins as investments in general. The best investment coins have a proven track record to provide high returns along with an active market for when it comes time to sell the investment coins. Why Are Rare Coins a Good Investment? Our Boston investment coin specialists consider buying rare coins a good investment strategy if done correctly. Investment grade coins should have a pedigree, certificate of authenticity, and be easy to track its price over the years. Trust our experts to help you find the best investment coins for sale and the best investment coins to collect. Are silver coins a good investment? This is one of the most commonly asked investment coin questions. If you are considering a silver coin investment, come talk to our specialists first. 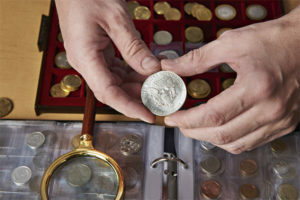 We’ll show you our silver coins investment guide and explain how to buy silver coins for investment purposes. We can explain the difference between silver bullion coins, numismatic silver coins and semi-numismatic silver coins. At Boston Estate Buyers we specialize in buying investment silver coins from our customers who need to sell their investment coins for profit. What about Investment in Gold Coins? Gold coins are a good investment when they are rare and carry a collector premium based on historical supply and demand. Looking for good investment in gold coins advice? Speak with your trusted Boston Estate Buyers before you buy, and especially before you sell a gold investment coin from your collection. We pride ourselves in fair appraisals on gold investment coins and offer cash payouts, and can help you source the best gold coin to buy as an investment. It is important to differentiate between the value of bullion coins, which fluctuate according to the market price of gold, silver or platinum, and true investment coins that carry a collector premium that is backed by historical supply and demand. The best investment coins to collect are ones in superb condition. The demand for these accurately graded, high quality or rare investment coins for sale is quite high. Book an Investment Grade Coins Appraisal Today! If you are looking to sell silver coins or sell gold coins (or sell your investment coin collection) contact Boston Estate Buyers today. We can offer you an immediate payout when you sell your investment coins to us! Or call us today at 617-523-1193 or send us an email.